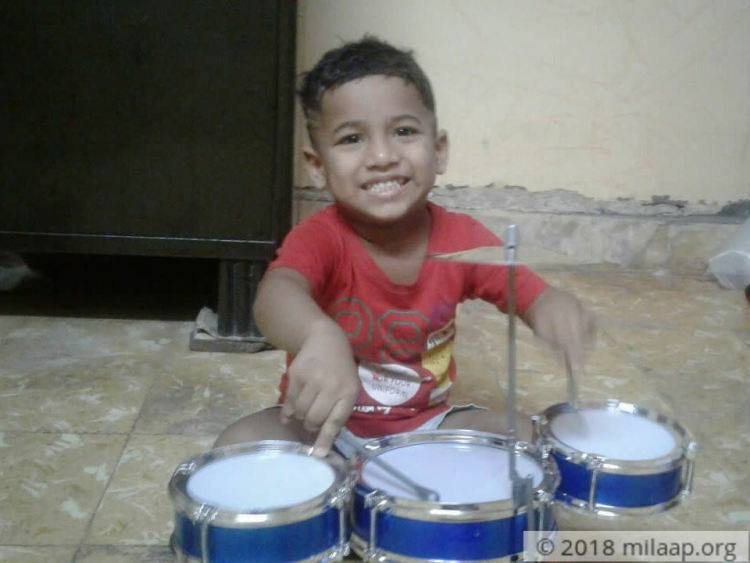 “Kaivalya is just 3-year-old but he is a very smart child. We have not told him anything about his illness but I fear he knows that something serious is going on with him. Once while we were taking him to the hospital by the local train, he asked me ‘Maa, this is not going to be as painful as the last time, right?’ I promised him that this time it would be better but with every passing day, he is suffering more and more." - Devyani, mother. 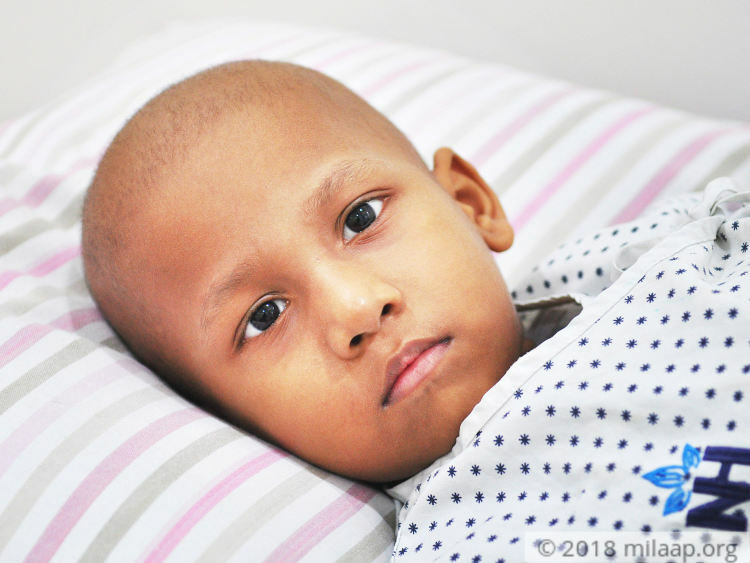 Kaivalya has been diagnosed with Acute Myeloid Leukemia - it starts in the bone marrow and prevents immature blood cells from growing into healthy blood cells. Every day he wakes up with a sharp pain in his bones, joints or sometimes even in his stomach. The doctors have told Devyani and her husband Yashwant that more cycles of chemotherapy followed by an immediate bone marrow transplant is the only way Kaivalya will get better. “We had enrolled him to a play school in the month of April when he had turned 3. 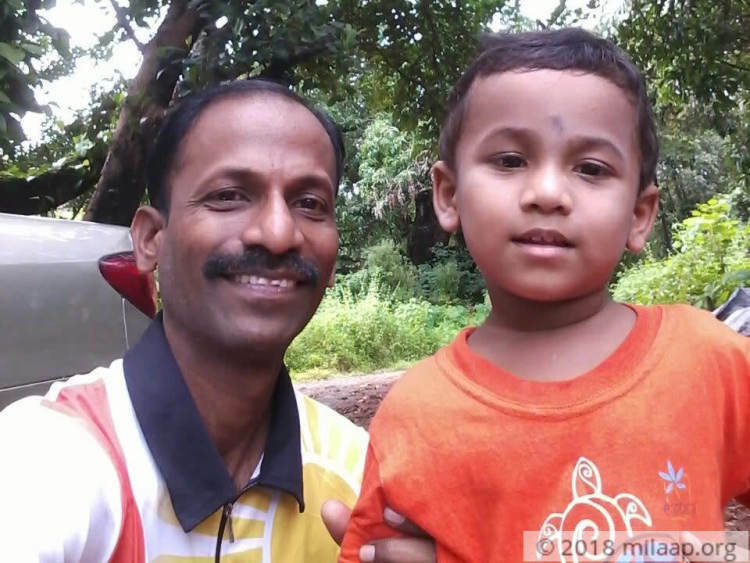 Unlike most kids, Kaivalya loved going to school and every day he came back home and told me stories of his new friends. But suddenly he had a fever that was not getting cured for 15 days. We took him to the hospital where the tests came as a rude shock to us - that he has cancer. He has not been able to go to school for a long time. He misses his friends and teachers and asks me when he can go back. I don’t have an answer for him,” - Devyani. 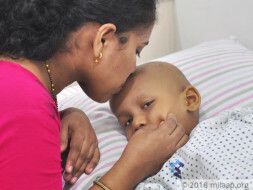 Devyani and Yashwant’s life has not been the same since Kaivalya’s diagnosis. They have been in and out of the hospital for their son’s treatment. Devyani has constantly stayed by her son’s side in the hospital whereas Yashwant’s sleepless nights were spent in the hospital corridors. “Despite his weakness, Kaivalya doesn’t like lying down in the bed. He runs around the house and plays with his cousins. He keeps on asking me when we will go for outings like old times but we are too scared to take him out for fear of infections and diseases. HIs immune system has worsened. Often he has severe diarrhea and we even noticed blood in his vomit. He also has severe breathing problems and we are scared all the time,” - Devyani. Yashwant works as a technician in a private firm and his monthly income of Rs 10,000 is not enough to support the family at times, leave alone carrying out a bone marrow transplant. 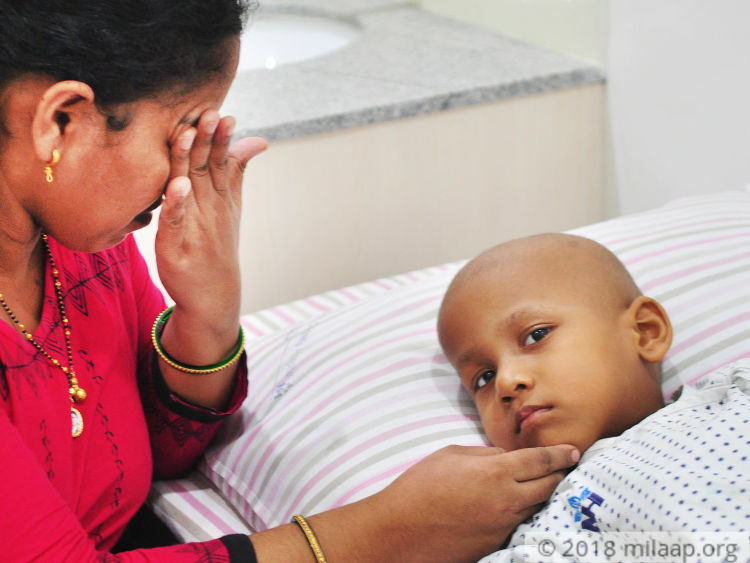 These days, he can hardly go to work because he needs to take Kaivalya to the hospital for his treatment. “I try to be strong in front of my son but often break down in front of my wife. I feel completely lost. 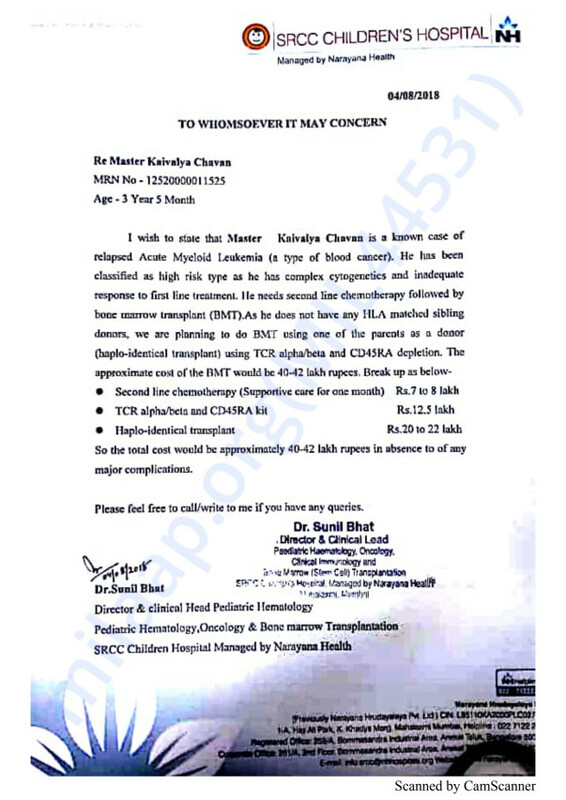 I have spent around 4 lakhs for Kaivalya’s treatment and all my savings have been used up. I have been borrowing from my relatives and colleagues but I don’t know how long this is going to continue. The surgery requires 42 lakhs. I am ready to be the donor but I have no idea how I can arrange for this amount and I have no one to turn for help. I fear that I might fail in saving my son’s life.” - Yashwant. 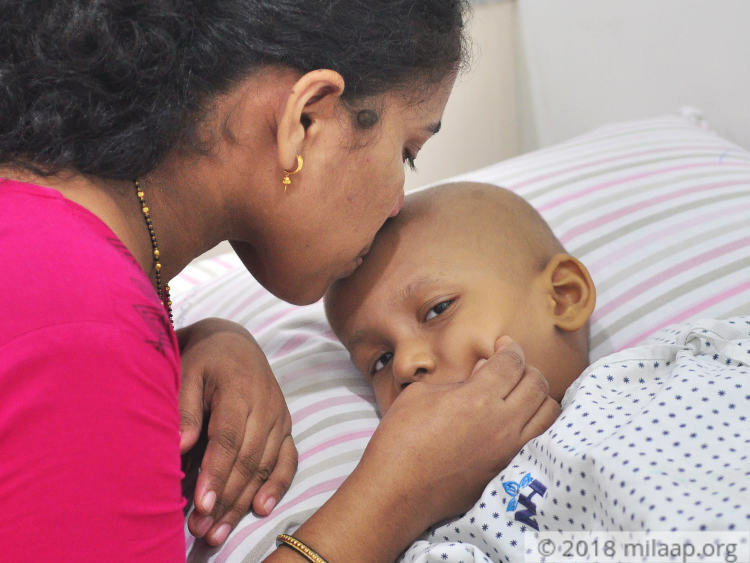 3-year-old Kaivalya is fighting cancer and the only way he can survive is through a bone marrow transplant. Devyani and Yashwant are trying very hard to save their son. But the cost of the surgery is enormous and Yashwant’s meagre salary will not cover even half the surgery. 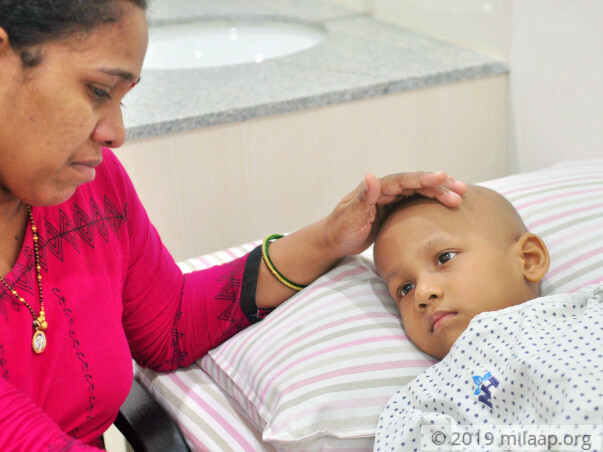 The parents are spending sleepless nights to save their son’s life and only your support can save Kaivalya. Kaivalya is not going very well right now. He is admitted in the ICU as of now because his health is very unstable. He had undergone pre-bone marrow transplant chemotherapy. Only once the infection is completely gone, they will be able to conduct the bone marrow transplant. If the infection is not zero, then they will have to resume the chemotherapy again. They haven't found a donor for him yet. He had developed a fever and his stomach has also swelled up. He is being treated with antibiotics. The doctors have also conducted a sonography. 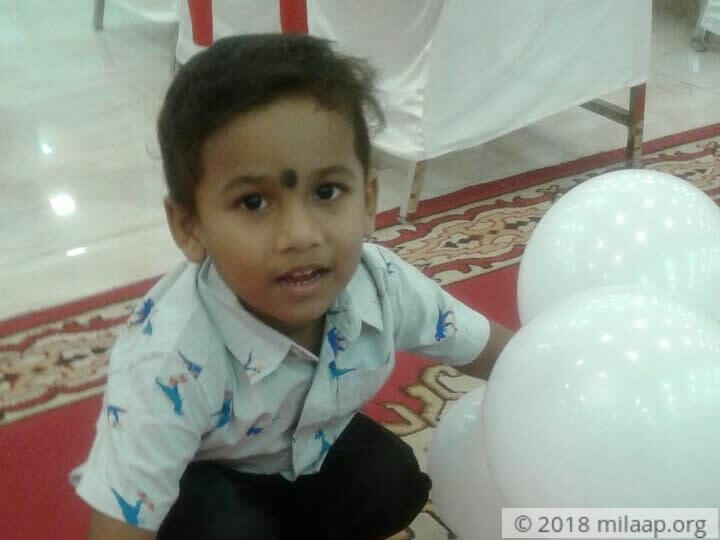 I request you all to please keep sharing the campaign as Kaivalya needs more funds for his treatment and since he is in the ICU right now, the expenses are also piling up. Kaivalya is at home and is doing fine. He was admitted in the hospital for 9 days for chemotherapy but there were some complications and he could not undergo the chemotherapy. As of now he is done with 3 cycles of chemotherapy. The doctors have said that he will have to undergo 2 cycles of high dose chemotherapy. He will undergo this cycle of chemotherapy starting next week. The doctors have been looking for donors from outside as they haven't found one yet. Thank you all for supporting us. Please pray for Kaivalya's speedy recovery. I am delighted by the love and support blessed on Kaivalya. I would like to inform you that he is presently home and is under medication. We are still looking for a donor for the transplant and in case if we aren't able to find one, me or my husband will do the recipient test. Who's ever organ matching percentage is higher, will be the donor. A heartfelt request to all of to please share the campaign so that we can raise enough funds for the transplant, or else his health will keep getting worse as time passes. Thank you!